It's Thursday and I have another entry into the Christmas in July daily challenges at Catch the Bug. They asked players to use an Oldie but Goodie, meaning anything that isn't a "new" stamp. Here's one I've had in my collection but I don't think I've ever used it. I tried something I saw on one of the blogs I follow and found it pretty easy. It's an envelope card, meaning the image is in the very center of the envelope and the sides and top flaps all fold in to make the envelope. It's held shut with a slip-on loop but you could close it with a ribbon, too. I colored the image with ProMarkers and water colors, then cut the image with a square die from Spellbinders. I inked the edges with a ProMarker and centered it into the envelope. I made the envelope from a leftover piece of scrapbook paper, putting the color on the inside and the white on what will be the outside when it's all folded. Because I wanted it to be flat, I added no embellishments of any kind so this is a very CAS card design. 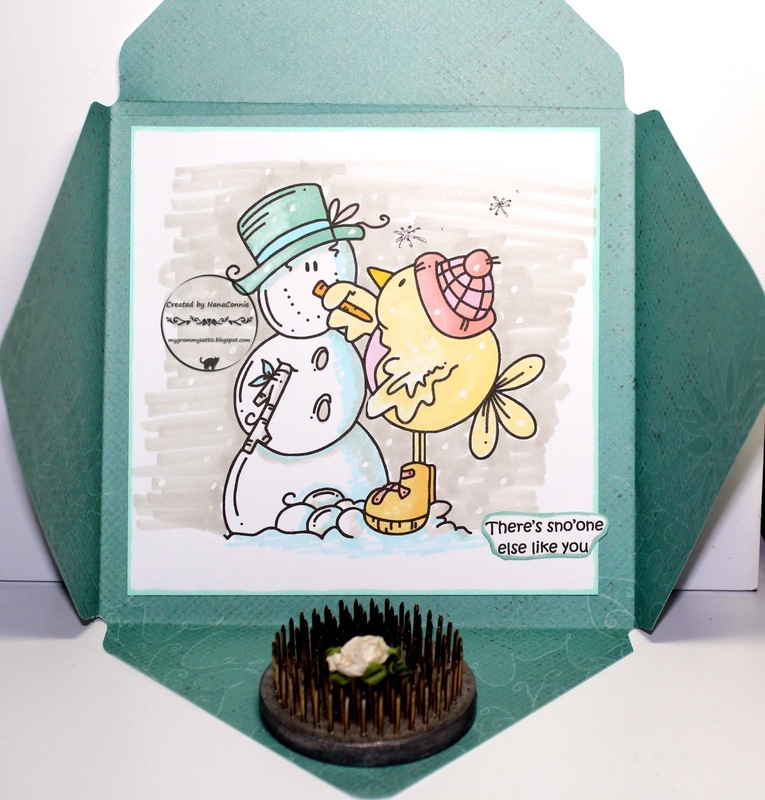 This is gorgeous Connie, love the image and you do CAS cards magnificently. Love that birdie making a snowman! Such a fun card! Oooo, I've never made one of these. I feel very inspired! This is too cute! Adorable image and fun sentiment! Thanks so much for sharing this with us at Penny's Paper-Crafty Challenges! Your envelope card is so pretty and the design is perfect for that image. I've never seen that one before but it's so cute. ADORABLE, thanks for playing along during our Christmas in July week at Catch The Bug. This image is very sweet Connie! Love that special fold design you've made with this too!! Such a cute card. Love that image and the soft colours your used. Thanks for playing along with us at Catch the Bug for our Christmas in July celebration. Good Luck. Very nice! Thanks for joining us at Crafting from the Heart Challenge Blog. Good luck! 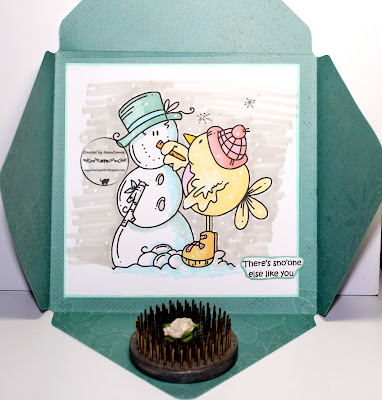 Love your envelop card,and the adorable image great fun card.Thanks for joining us here at Penny's crafty challenge blog Lyn DT x. Adorable!!! Such a cute image and what a fun idea to combine the card and envelope in one! Thanks for playing with The House That Stamps Built.